Want a fun and spontaneous way to advertise your business? Car lettering is a great way to advertise while you are on the move. Instead of dreading Tampa, Florida rush hour traffic, you can think of all those people sitting in their cars as your potential customers just waiting for a distraction. Custom car graphics can be exactly what you need to give your business a little extra boost. Among the most popular forms of advertising locally are banners. Banner-making has lasted through centuries because it is the most effective way to capture the interest of your audience. You only have a few seconds to peak interest in a complete stranger, so do it with a bang. What says “LOOK AT ME” better than an enormous vinyl banner printed in “BRIGHTCOLORS” to advertise your business? Make your audience wonder what you can do for them. Raise their interest in your business with a high quality custom vinyl banner. We will custom make any banner for your business, specifically suited to meet your needs. Our in-house team is ready to get creative to bring you more business. For more information about our banner printing services in Tampa, contact our sales department today 727-459-9460 or e-mail us and we will be glad to help. Businesses that have heavy traffic need something to point customers in the right direction. Directional signs relieve the customer from any confusion they might have navigating a large building or even a parking lot. Instead of having to try to find their way as if they were in a maze your customers can know exactly where they need to go. So if you want to make your building easier to navigate or want someone to find your home business, call us. We can accommodate all your directional sign needs. Magnetic signs for your vehicle can be an asset to your company. They are easily changeable, and can be made with your company logo and colors. 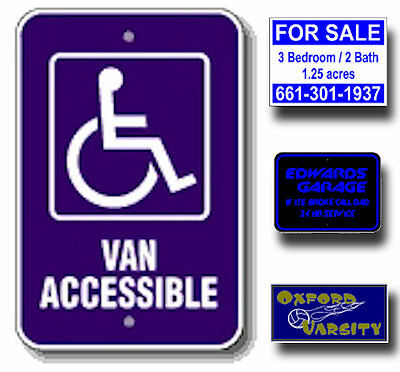 Magnetic advertising signs are an easy way to represent your company on any vehicle you drive. It will make you instantly identifiable by others. Ocean Palm Graphics can design and produce custom magnetic signs in various shapes and sizes to suit your needs. We produce quality signs at an affordable price. Whatever you’re looking to identify your business or promote your company, call 727-459-9460 or e-mail us today to discuss how we can help you. Create a jaw-dropping outdoor sign. We can create the ideal outdoor signage to enhance your business’ image. Tell everyone you are open for business and eager to serve. We are ready to design, and construct custom outdoor signage. We can fabricate your sign and install it for you. We have so many different options to choose from, so call 727-459-9460 or e-mail us to see which would benefit you the most. Real estate is very competitive, and a good “FOR SALE” or “FOR LEASE” sign can help you stand out of the crowd. Sometimes blending in is unavoidable unless you have the proper signage. Ocean Palm Graphics can help! We can get your real estate company noticed in Tampa ,St Petersburg Areas and all Gulf Beaches North to Hudson FL ,we service all of Pinellas and Pasco Counties. Whether its commercial or residential real estate doesn’t matter we can still get your name out there. Construction is also vital to our economy and Ocean Palm Graphics can provide any kind of construction signage your business might need. Whether a required city ordinance or a sign to promote your new development, we can help. Increasing sales is the top priority for businesses after customer service. Attracting new consumers may be hard, but storefront signage can help your business gain new customers. Businesses in Tampa choose storefront signs to help create a buzz that will attract more consumers and let everyone know exactly where they are. Ocean Palm Graphics can design and create a storefront sign specifically for your business. A storefront sign can range from a logo to a name to a sale advertisement; whatever you want we can make. 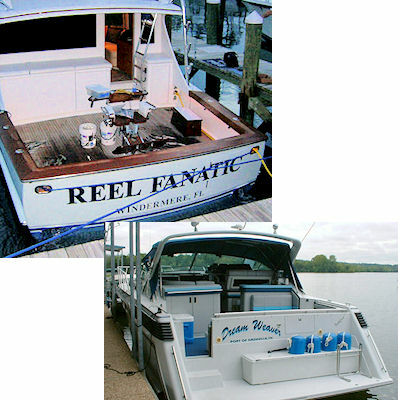 Ocean Palm Graphics has a design team ready to tackle any task you may have. Ocean Palm Graphics can get the ball rolling for your business with a spectacular storefront sign. A truck is a giant canvas, and there is no reason for it to be blank. Truck signs are an easy way to advertise. They can be seen from all around the areas of Tampa Bay as well as Pinellas & Pasco counties . Ocean Palm graphics can put any combination of color or digital graphics that you want on your truck. Our design team is waiting to customize your truck graphics. Truck advertising has grown for a reason; businesses are getting the results they want. 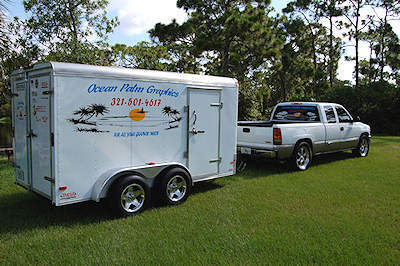 Ocean Palm Graphics can get truck lettering on your truck at an affordable price. Contact us for more information on truck signs. Generate more of an audience with window signs, and keep your existing customers in the know how with window signage. Advertise special sales that are going on within your business to attract a flow of new customers. Window decals are an easy way to advertise products unique to your business. A window sign can place you above your competitors. Become the leading business in your industry with window signage. We can custom design any window sign you would like to see placed in your window. Florida businesses enjoy the benefits of window lettering on a daily basis. Ocean Palm Graphics is the sign source for quality window signage.